The scenery of historic Hudson Valley makes Buttermilk Falls Wedding Pics extra lovely. The Buttermilk Falls Inn and Spa is located just 75 miles out of New York City and provides couples and their guests with a quaint escape from their everyday lives. The inn is perfect for both wedding ceremonies and receptions, with the added bonus of having some space for wedding attendees to stay overnight. The venue has on site accommodations for about 50 guests, with rooms that provide breath-taking scenery from every view. Wedding celebrations can be held on the vast Reception Patio, which looks out on a long stretch of the Hudson River, or at the Barn at Buttermilk. In these Buttermilk Falls Wedding Pics I took the bride and groom for a walk around the natural beauty of the inn’s grounds. 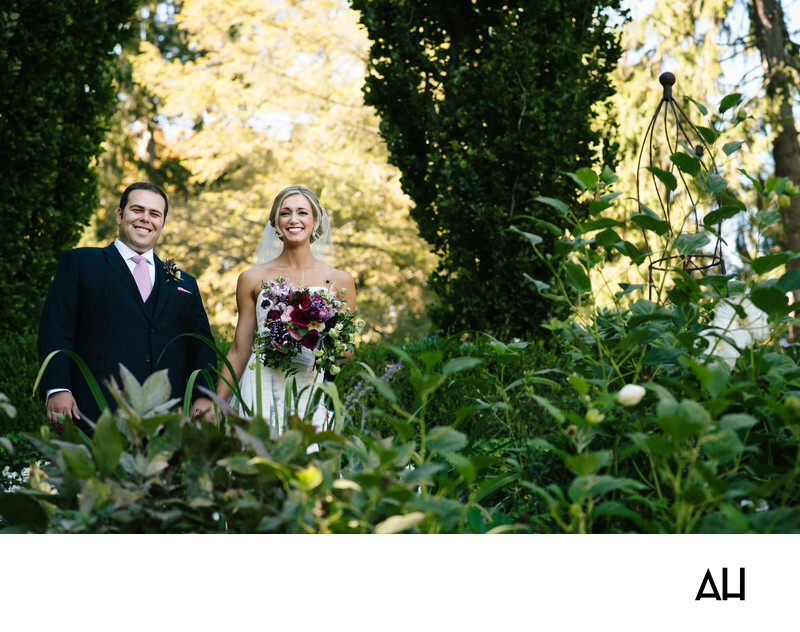 This portrait shows the bride and groom standing together in a sea of trees, flowers, and other greenery. The pair are holding hands and grinning from ear-to-ear. The happiness that radiates out of them is palpable and the two seem to glow in the joy of the day. That glow is made only brighter as the sun shines through leaves behind them. The scene is as natural and beautiful as the smiles on the newlywed’s faces. The bride and groom stand out in the green of the gardens around them in their classic white and black wedding attire, as does the bride’s bouquet. Vivid shades of red, pink and purple spill from her hand in vibrant disarray. In this exquisite setting, the couple present a candid image of pure grace and love.